One who lives apart; one who has made a vow of abstinence; in the former sense used as early as Sifra, Emor, iv. 3; Sifre, Num. 23. There were different reasons for taking the Nazarite vow. "It is usual with those that had been afflicted either with a distemper, or with any other distress, to make vows; and for thirty days before they are to offer their sacrifices, to abstain from wine, and to shave the hair of their heads" (Josephus, l.c.). The vow was taken also for the fulfilment of a wish, such as for the birth of a child (Naz. i. 7; comp. 9 and 10). "The pious in ancient times took such a vow, that they might have an opportunity to make a sin-offering" (Ned. 10b). "If one sees a woman suspected of adultery and convicted by the water of jealousy [Num. v.] let him become a Nazarite, since the law of Nazariteship follows immediately in Num. vi." (Ber. 63a). Some said: "I shall not die before I have become a Nazarite" (Ned. 3b), or, "Let me be a Nazarite on the day when the son of David [the Messiah] shall come." Such a Nazarite was allowed to drink wine only on the Sabbath and on feast-days, since the Messiah will not appear on these days ('Er. 43a). A shepherd who saw a lock of his own beautiful hair reflected in the water, and was tempted thereby to sin, took a Nazarite vow (Tosef., Naz. iv. 7; Ned. 9b). Although Nazariteship was marked by asceticism, many abstained from wine and meat even without taking the vow (B. B. 60b; Shab. 139a). Because of this some prominent rabbis who were opposed to asceticism regarded as sinners those who fasted or became Nazarites or took any vow whatsoever, and held that the person in question was an evil-doer, even if the vow was fulfilled (Ned. 9a, b, 20a, 77b; Naz. 4a; Ta'an. 11a). Women and slaves, who did not have full rights before the religious law, could take the Nazarite vow, but only with the consent of their husbands or owners, while the vow was not valid among the heathen (Naz. iv. 1-5, ix. 1, et passim). Fathers were allowed to dedicate minors, but mothers were forbidden to do so (ib. iv. 29b). The proper name "Nazira" may be connected with some such custom (Gen. R. lxxxii. end, et passim). Jesus is said to have been dedicated while still in the womb (Luke i. 15). Tradition regards not only Samson and Samuel, but also Absalom, as Nazarites, the last on account of his long hair (Naz. 4b). The duration of Nazariteship was voluntary, and ranged from one hour to a lifetime. In the former case, however, it really lasted for thirty days, which was also the period when no definite time was set (ib. i. 3; Sifre, Deut. 357). While the usual time was thirty days, two or more additional vows were generally taken, in which case each period was regarded as a separate Nazariteship, to be immediately followed, when duly completed, by the succeeding one (Maimonides, "Yad," Nezirut, iii. 6). The period was at times measured by the number of days of the solar or the lunar year (Naz. i., end; Yer. Naz. 54b); or one might say: "Let the number of my Nazariteships be as the hairs of my head, or as the dust-particles of the earth, or as the sands of the sea" (Naz. i. 4). A Nazarite for life might cut his too abundant hair once a year, but a Samson Nazarite might not cut his hair under any circumstances, although he might defile himself by touching a corpse (ib. 4a). While no comb was allowed to touch the hair, it might be cleansed and arranged by other means (ib. vi., end). A proverb says, "Let the Nazarite go around the vineyard, but let him not approach it" (Shab. 13a and parallels; Num. R. x.). 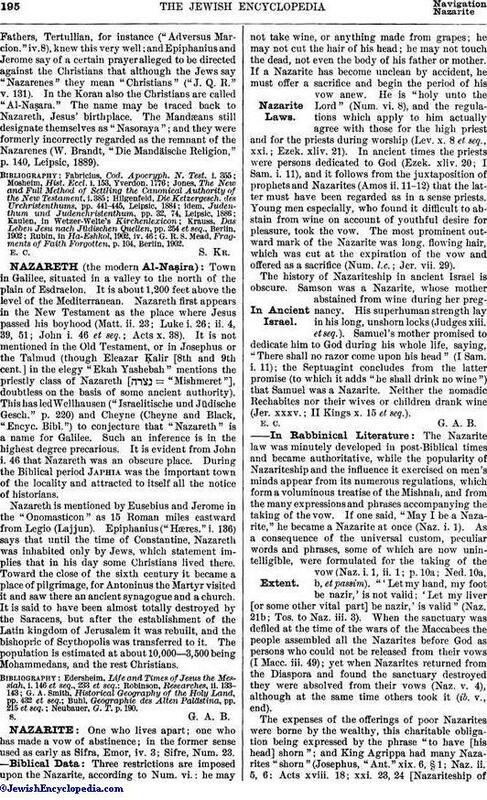 Nazarite vows were taken also outside of Palestine (Naz. v. 4; iii. 6). Besides Helena, Queen of Adiabene, Miriam of Palmyra is mentioned as a Nazarite (Tos. to Naz. iv. 10). 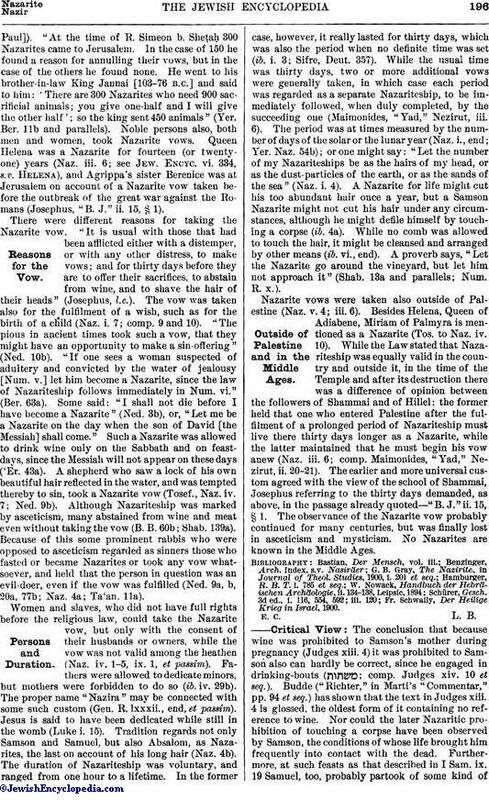 While the Law stated that Nazariteship was equally valid in the country and outside it, in the time of the Temple and after its destruction there was a difference of opinion between the followers of Shammai and of Hillel: the former held that one who entered Palestine after the fulfilment of a prolonged period of Nazariteship must live there thirty days longer as a Nazarite, while the latter maintained that he must begin his vow anew (Naz. iii. 6; comp. Maimonides, "Yad," Nezirut, ii. 20-21). The earlier and more universal custom agreed with the view of the school of Shammai, Josephus referring to the thirty days demanded, as above, in the passage already quoted—"B. J." ii. 15, § 1. The observance of the Nazarite vow probably continued for many centuries, but was finally lost in asceticism and mysticism. No Nazarites are known in the Middle Ages. Fr. Schwally, Der Heilige Krieg in Israel, 1900. The conclusion that because wine was prohibited to Samson's mother during pregnancy (Judges xiii. 4) it was prohibited to Samson also can hardly be correct, since he engaged in drinking-bouts ( ; comp. Judges xiv. 10 et seq.). Budde ("Richter," in Marti's "Commentar," pp. 94 et seq.) has shown that the text in Judges xiii. 4 is glossed, the oldest form of it containing no reference to wine. Nor could the later Nazaritic prohibition of touching a corpse have been observed by Samson, the conditions of whose life brought him frequently into contact with the dead. Furthermore, at such feasts as that described in I Sam. ix. 19 Samuel, too, probably partook of some kind ofintoxicant, and he can not have kept himself free from contact with dead bodies, for he hewed Agag in pieces (I Sam. xv. 33). Samson and Samuel, then, belonged to an early type of simple devotees to Yhwh who were distinguished by unshorn hair. This meaning of the word is preserved in Lev. xxv. 5, 11, where "nazir" is used to describe an unshorn vine. The Nazarites of Amos must have had a different origin from those with long hair. Because the Rechabites also are said (II Kings x. 15 et seq. ; Jer. xxxv.) to have abstained from wine it has been conjectured that the Nazarites of the time of Amos were, like the Rechabites, representatives of the pre-Canaanitish type of Yhwh worship and abstained from all the luxuries of civilization; there are no data to prove or disprove this hypothesis. The law of Num. vi. 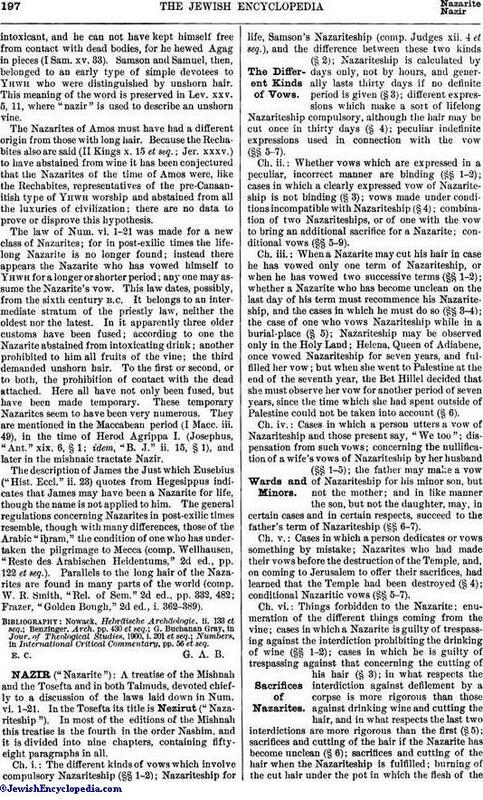 1-21 was made for a new class of Nazarites; for in post-exilic times the life-long Nazarite is no longer found; instead there appears the Nazarite who has vowed himself to Yhwh for a longer or shorter period; any one may assume the Nazarite's vow. This law dates, possibly, from the sixth century B.C. It belongs to an intermediate stratum of the priestly law, neither the oldest nor the latest. In it apparently three older customs have been fused; according to one the Nazarite abstained from intoxicating drink; another prohibited to him all fruits of the vine; the third demanded unshorn hair. To the first or second, or to both, the prohibition of contact with the dead attached. Here all have not only been fused, but have been made temporary. These temporary Nazarites seem to have been very numerous. They are mentioned in the Maccabean period (I Macc. iii. 49), in the time of Herod Agrippa I. (Josephus, "Ant." xix. 6, § 1; idem, "B. J." ii. 15, § 1), and later in the mishnaic tractate Nazir. The description of James the Just which Eusebius ("Hist. Eccl." ii. 23) quotes from Hegesippus indicates that James may have been a Nazarite for life, though the name is not applied to him. The general regulations concerning Nazarites in post-exilic times resemble, though with many differences, those of the Arabic "iḥram," the condition of one who has undertaken the pilgrimage to Mecca (comp. Wellhausen, "Reste des Arabischen Heidentums," 2d ed., pp. 122 et seq.). Parallels to the long hair of the Nazarites are found in many parts of the world (comp. W. R. Smith, "Rel. of Sem." 2d ed., pp. 332, 482; Frazer, "Golden Bough," 2d ed., i. 362-389). Numbers, in International Critical Commentary, pp. 56 et seq.